Representations of what to expect from 2019's new emoji, created by Emojipedia. The Unicode Consortium, which is responsible for approving each year's list of new emoji, has released the full details on 2019's upcoming batch. According to Emojipedia, there are 230 new emoji in total. These include a sloth, waffle, skunk, sari, white and brown hearts, and much more. 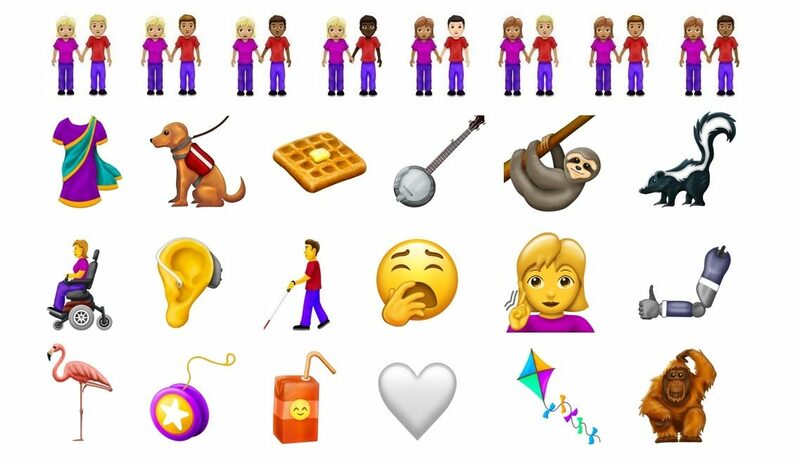 Among the most noteworthy additions is a group of emoji representing people with disabilities, which was actually proposed by Apple last March. These include a deaf person, person with cane, person in motorized or manual wheelchair, a guide dog, and much more. One other significant addition is newfound flexibility for the emoji of two people holding hands, which can now utilize varying skin tone and gender combinations. The last two years, Apple has launched the newest emoji in iOS 11.1 and 12.1, respectively. If the company follows suit this year, we should expect to get our hands on these new emoji with iOS 13.1 some time in mid-to-late fall.